Which iPad 3 Should You Get? 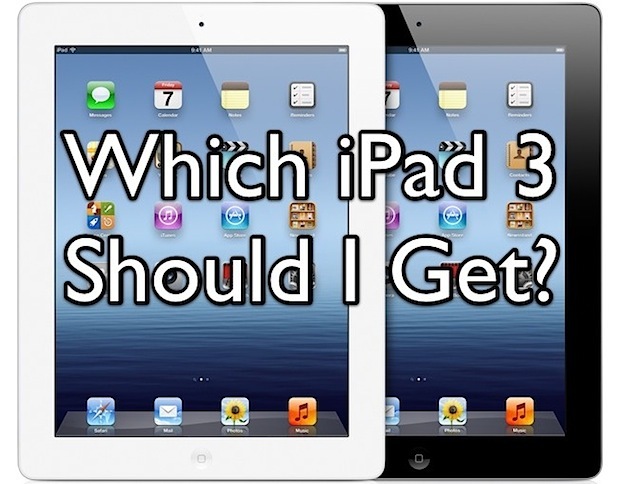 The new iPad is a beautiful thing and will attract many more people to the platform, and so the big question is; which iPad 3 should you get? The answer is pretty simple: buy the 16GB Wi-Fi model. Here are four reasons the base model is perfect, and an attempt to answer questions about color and the never-ending Verizon vs AT&T debate. 16GB is Enough: The average person uses an iPad mostly for browsing the web, reading and writing emails, and using a handful of apps. 16GB of storage is more than adequate for these tasks, and as long as you don’t intend to store a ton of music or movies on the device, it’s very unlikely you’ll run out of space. Remember, things like Netflix, Pandora, iTunes Match, and iCloud stream video and audio to the device rather than storing it, so you won’t use much space with those apps either. Wi-Fi is Everywhere, 4G LTE is Unnecessary: Most people don’t need an iPad with a cellular connection. First, studies show that most people use the iPad at home in the evening, doing something like sitting on the couch while watching TV. Secondly, the next iPhone is almost certain to have 4G LTE. What’s an iPhone have to do with the iPad? Wi-Fi hotspot of course! You can do this already with an iPhone’s 3G connection, and soon enough you’ll be able to share the next-generation iPhone’s 4G LTE connection with the Wi-Fi iPad model, plus other devices. Frankly, everyone I know with a 3G iPad never or rarely uses the 3G ability, let alone leave the house with the device. Wi-Fi is ubiquitous these days, especially when your iPhone can spawn a hotspot. Save the money. Price: This is obvious but it’s the cheapest model, why spend more for features you probably won’t use and for space you likely don’t need? Best Resale Value: The cheapest model holds it’s resale value the best, whereas the 32GB, 64GB, and all 3G models quickly lose their price premium on the resale market. Keep in mind that iPad 3 specs are the same other than the storage capacity and 4G capability. All models have the same gorgeous Retina display, all models have the same processor and graphics abilities, and all models include the same camera. The only other difference between models ends up being the availability during the initial months, with the 16GB models tending to sell out faster than anything else. To avoid that, you may want to pre-order now. This will be a matter of opinion. The black model tends to make on screen images look their best, simply because a black border is less distracting and emphasize images on the display instead. On the other hand, the white model doesn’t show nearly as many fingerprints and smudges, and the white iPad will in turn look much cleaner than the black model. Ultimately the color comes down to choice, but ask yourself, do you want the iPad to look cleaner? Or do you want the iPad border to emphasize what’s on the screen? Personally I prefer the black model, but for an iPad that gets a lot of use a white model will look nicer since fingerprints don’t really show up on the border at all. Screw You, I Want the 4G LTE Model Anyway. Should I Get Verizon or AT&T? Ultimately this depends on your service area and where you intend to use the iPad. Coverage and reception quality varies between Verizon and AT&T, and you probably know your location better than anyone. Data plans for both providers cost the same at this point, although Verizon offers a 10GB plan that AT&T doesn’t. How you would consume 10GB of data on an iPad is beyond me, you’d have to be streaming a lot of movies I guess. What About iPad 2 for $399? Personally I think the Retina display is going to be such a huge difference that it’s worth the extra $100 to get iPad 3. Yes, the iPad 2 at $399 is a great deal, but chances are good that once you see an iPad 3’s display you’re going to wish you had one, much the same way the iPhone 4’s display looks leaps and bounds better than the iPhone 3GS. If you don’t care about screen quality though, sure, save yourself the $100. Actually, you can save $150 and get a refurbed iPad 2 for $349 from Apple’s Online Store. Do you agree with this advice? Do you disagree? Let us know in the comments. iPad GUI designers take note: iPad GUI element set in a layered PSD file! I went with a 16gb black wifi for pretty much the exact reasons stated. Good advice. White 16GB here, so stoked for the 16th! Same here save $100 + 10 tax and got white 16gb iPad 3 very satisfied no worries about storage. Now I have lots photos, few videos and more than 100 apps in there with 9 or 10 gb available storage space. The bigger problem with 4G is that it’s limited to big cities right now since carriers are so slow to roll it out. The moment you leave a metro area you lose the speed advantage and are back on 3G. This isn’t a huge deal if you live in a flat metro area, but for those of us on the west with hills and mountains and what not all it takes is a hill or two to quickly drop 4G and 3G and you’re left either without reception or on the miserably useless EDGE network. 4G is pretty good on the east coast, but just not adequate in the west coasts hillier cities. Unfortunately the coverage maps don’t really demonstrate that well, so the best thing to do is borrow a 4G phone and take it to the locations you’d like to use and verify coverage. You’ll be surprised at some of the black holes of reception even in huge cities like San Francisco. Also, if you load movies up on an iPad for the kids to use on car drives and plane flights, go for a bigger model. 32GB is probably adequate, but 64GB is good if you want a library of HD content at your disposal for a vacation. Personal and casual use, 16GB is fine indeed. I have an iphone4 and I want an ipad. I’m going for the ipad 3 as I agree with many of your comments. Q. Is it worth buying a Mi-Fi so my ipad 3 16G Wi-Fi only can connect to it as well as my iphone, laptop etc? If so, would are there any you would buy or more importantly any you would stay clear of. You can get them from between £10 – £18 per month. Q. Can you upgrade to the 4G network next year if you only buy a Wi-Fi only ipad now, especially with up to x10 speeds faster. I don’t have experience with Mi-Fi and hotspots, so I can’t help you there, but I can answer question 2. You can’t upgrade an iPad. A WiFi iPad can’t be upgraded to 3g or 4g, and a 3g can’t be upgraded to 4g. Unless you’re going to use a large amount of data on the iPad, I really don’t see the point of the Mi-Fi and paying monthly on that, presumably under another contract (?). You could get a 3g or 4g iPad and have a contract-free data service you can choose to renew or not renew every month. You might find that you hardly use any 3g or 4g data on an iPad and Wi-Fi is enough, but being able to turn on data for a month at a time is a nice feature, especially on holiday, etc. where you are unfamiliar where Wi-Fi spots are. I disagree Jeff. iPads are mostly useless unless connected to the Internet. As I discovered, once I leave home about all I can do is read a book. The best part of the iPad to me is the seamless connectivity. Wherever I am, I can surf, check mail, use iCloud, etc. Also, maps and other location based services don’t work well without GPS, and the WiFi models don’t have GPS. This was the show stopper for me. Gotta have GPS for maps ‘n apps. If you are really on a tight budget, go with the iPad 2 with 3G rather than an iPad 3 with wifi only. I both disagree and agree. It’s a kind of meh point. With Bluetooth 4.0 we will also see a number of Bluetooth based GPS add-on units. I already use one with both my WiFi iPad 2 and iPod Touch. The unit itself was ~100 dollars, about 20 dollars less then the 3G option at the time. It’s usable by my Mac, iPad, iPod Touch, and anything else that can take it’s input. It lasts about 8 hours on it’s charge. So not getting LTE does not hose you for GPS, you just have to buy the extra part. If I was on a really tight budget I wouldn’t be buying an iPad at all this cycle. I’d still be waiting for the iPad 4th gen. Thank you Tim B. Pointing out that WiFi models don’t have GPS secured my decision to pay the monthly fee for convenience. Actually, you don’t need to pay the monthly 4G service fee for the GPS chip to work. As long as you have the 4G model, you have the chip, and it will work accurately with or without a 4G data subscription. I’m one among a group of backcountry adventurers that use the iPad for its GPS functionality in remote areas that have no wifi or cellular signals, and only the 3G/4G iPads have this. A lot can be done on the iPad without having access to the internet. Due to iLife, I can make some music, edit my photos or make a movie. I can also play games, watch films and listen to music. Then, when I arrive home and I am connected to the internet, I can share those photos I edited, share that movie I made and share that song that I produced. In my opinion, the iPad is full of applications that do not require wi-fi and are very productive and enjoyable. Agreed with all those points. 16 GB has been fine for me on the iPhone 4 and I have tons of apps, photos, etc. Movies can be huge, especially HD – but, just make a little effort to manage your space, delete the big stuff when you’re done watching. These things are for mobile use, not really a storage locker. To me it feels like the base price allows you to upgrade maybe every two years, 600-900 is really pushing it. 4G is great for those who really really could use it.. But again it’s a fairly expensive upgrade, plus, the worst part, it’s just more monthly fees ontop of everything.. It feels a lot more expensive than it’s worth for most people. We all have smartphones, wifi is all over. I could see 4G for those who commute on trains every day, but most people could do a lot more with the money. Hell, skip on 4G and you’ll have enough money for all the apps you’ll need for a few years. but one thing sure, I must care about is the storage, 16GB was very short for me, so double to 32GB will be great for me. Great advice. I was thinking about changing my order to get one with 4G, but you’ve made me totally comfortable with my decision. Thanks. I did however go with white to match my iPhone 4S. I had to do it. My first iOS device was an 8gb iPod Touch. I quickly realized that it wasn’t enough storage, even with no music on it, just because of the tons of apps I use. When I bought an iPad 1st generation I chose a 32gb, and same when I upgraded to iPad 2. 16gb is fine for a first time iOS user, a very casual user, etc. If you’re a heavy user on your Mac, you’ll almost certainly want at least 32gb for an iPad. Keep in mind that the WiFi only model does not support assisted GPS. In reference to this statement, would you need to activate your 4G service to take maximum advantage of GPS or will your unactivated 4G model be equivalent to a wifi-only model? As i recall assisted gps worked with or without an active data plan on at&t ipad2. You do not need to turn on or even activate your 4G subscription to get full GPS functionality. You merely need to have purchased the 4G model, as it is the model that has the stand-alone GPS chip. I agree with Dean, 32 gb is the way to go. Enough space to load up apps, movies, and music, plus some breathing room “just in case”. Wifi only is fine since wifi is available virtually everywhere and most likely you’ll be using your iPad at home anyway. I don’t have any iPads but like your advice on the iPad 16G model. I have a MacBook Pro. I’m grandfathered in on unlimited data on my iPhone 4, so your advice to just turn on the hotspot feature falls a little flat. I’ve got a 16 gb iPad 2 (WiFi-only), but I’m considering upgrading to the new iPad (still 16 gb) simply so I can get the 4G connection, as I almost immediately regretted getting the WiFi-only model. 16GB is nowhere near enough space. I have a 32GB iPad 2 and I run out of room just trying to update apps. I only have 2 pages of apps and it fills up almost 19GB, that’s with no folders. I have an iPad 1 16gb Wi-Fi. It has enough storage for everything I need. The retina display on the iPad 3 sounds great, but I think I can live without the other improvements for a while. What I can’t live without is the iPad itself. Serious question, what do you use for your iPad for that you can’t live without it? 16gb iPad original, but with 3G. I’ve used e 3G about four times (four one-month contacts) when travelling. Wifi is not helpful if you are driving in the country and need to download a document or get directions, both of which I’ve done. The extra $130 is small price to pay for being connected just about everywhere, and the month-to-month contracts cost only when you need them. Totally agree with your intelligent and logical analysis. I bought a 64GB 3G iPad 1 and have used the 3G maybe 5 times and till have over 32GB in storage left after 2 years. I have just preordered the 32GB WiFi model as 4G is a long way off in the UK and I have a large music collection so need more than 16GB. I have an iPhone 4S so cn use that as a hotspot if I need 3G. Good work, more good advice please! Does the iPad WiFi allow GPS access? Thank you. The wifi only iPad only has assisted GPS. In other words, it only works when you are connected to wifi, and it is reporting your wifi location, not the actual location of the iPad. The only model that has a true GPS chip is the 4G model, and the GPS chip will even work without activating a data subscription! I know I’m going to be way in the minority here – but want to point out there ARE diff strokes for different folks. In my circles a phone that can TXT and make calls is all the “phone” I need, so I don’t need a phone data plan – and outside of Siri (maybe still to come), the iPad lacks nothing else the iPhone has. And when I’m net connected I want screen real estate – I find accessing the web, maps, watching videos, etc. with the iPhone’s # of pixels limiting, and typing a real chore. And I always have a briefcase or over-the-shoulder bag with me – which I could lighten by 1.5 pounds of stuff I won’t need with an iPad at hand. I’m also going to be recording (and editing) lots of live performance video and stills (especially since they’ll be taken on my editing device), so 1080p is going to fill up space fast. I’m going to want a lot of those on-device since I often keep editing things through many phases of refinement and variation. And let’s say I DID handle those files via iCloud or SugarSync/DropBox. The download times are going to slow me down (and chew up my data plan). …plus the iPad is ALSO going to replace my notebook for 90% (or more) of my outside the house forays where I’ll need net so the investment in 4G and 64GB makes that essential. and in fact, its extreme mobility will probably make me not use computers that much at all at home either as I’ll just be dragging around. So let’s say I use 10 GB a month – that’s $80 for my home and road internet use. That’s only $15 more than I pay now for home net to get both home and away, and if 13 GB, only the cost of a basic data plan for the iPhone I won’t need – plus I’ll save $2-400 upfront on the cost of a new phone…. ….which brings the price of the tricked out full-boat iPad down the price of the base model. Ha! If 4G has the speed I believe it has (and I’m, yes, in Verizon’s 4G area), I win! I got the white 16GB wi-fi but I do wonder if I will want 32GB in the future. It’s my first iPad, so we will see. I didn’t get 4G for the reasons you mention, I have an iPhone with Hotspot and the contract expires this year. We created an app ‘Coverage?’ for traveler’s last year that actually overlays the coverage maps for all the different carriers. As far as I know, it is the only way to directly compare LTE maps between AT&T and Verizon. I’m working on an update tonight that will make it even more useful. Check it out in the app store and let me know what you think. I completely disagree with the majority of this article, and I’m astounded by the blanket statement that one model suits the needs of the majority. While most people might start off thinking they’ll only use the iPad to surf the internet, check and write email and use a few Apps, (and this is where they begin), within 6 months of using the device they will find that there is so much more they can do with an iPad than just this. What about storing music and a movie or two for the road? After all, you don’t want to be streaming media on data limited data plans… and if these people take your advice and they don’t have a smartphone, they won’t be able to stream anything outside of a Hot Spot). Let’s not forget the camera (which is upgraded in the new iPad)… the one that can take HD video (which by the way, can quickly eat up a LOT of storage space). Naturally if you want to play around with that video in iMovie you’re going to need even MORE storage space. Lastly, let’s not forget the growing number of apps that allow you to perform a lot of productivity tasks to draft and store files and exchange them with your PC, including documents, spreadsheets and tables… and more. You think nobody will want a 3G/LTE model? What makes you think “everybody” is using a tethering-capable smartphone, or is paying for the data plan service that permits them to do this? A staggering number of baby boomers only posess a simple cell phone that uses a pay-as-you-go card, is turned “off” 90% of the time and stored in the glovebox of their car “for emergencies only”. This demographic may not wish to have a “smartphone”, but they may wish to access the internet with their iPad while at the cottage, or in the car on a long road-trip, or just about anywhere else that they can’t access a Wi-Fi hotspot. In terms of colour… I always thought Black would be best suited for games and video, while white would be better suited for reading… but this could be my opinion only (as I am more convinced that colour choice is largely influenced by personal taste, and nothing else). Being Canadian, I can’t comment on your networks speculation, but in closing I would encourage anyone reading this article to ask themselves to consider whether or not they will have a means to provide themselves with internet access outside of WiFi hotspots (or if they’ll ever need to), to save up for the largest storage size you can afford (because you will always want more than you have down the road… being a 32GB iPad1 user for two years with a mother who owns a 16GB version, I speak from experience on this). Black or White… whichever you prefer! You make a good point. I will go with a 32 gb wifi version-because i like to store a lot of music, audiobooks, and movies, and the main reason I would go with 4g is to be able to stream netflix, hulu, etc, but i that would take a bit of info. I’m from Italy, when I read this article I understand the difference between U.S. and Italy (Europe too, but Italy in particular). I don’t think 16gb is enough, expecially when u want to download movies and watch them via airplay. But what about the rest? “WiFi is everywhere”… No, unfortunately no. In Italy WiFi is only in some big city, so if u don’t live there u must have a 3G plan (we don’t have 4G!!!). Then… no iTunes in the cloud. So the entire music collection have to be stored in the iPad itself. Your English is perfectly understandable, Alberto. And if you thought you had a bad deal in Italy, in the South African iTunes store you can’t buy a single movie, song, TV program, e-book or game! I’ve ordered the 16GB 4G model. I agree that 16GB is probably enough space for day to day use. I realise that housekeeping isn’t fun or popular, but it can make for a lot of space saving if you remove apps that you don’t use often. In addition, for me space really isn’t an issue. I keep most of my media files on my NAS, and Netgear have an app for accessing it remotely. So if I unexpectedly need to have something from home, I can get it. Being in the UK means that 4G is useless for me. But I want the GPS and I’ll probably get a PAYG 3G data plan for when I’m out of WiFi. As I live in London, hopefully this won’t happen too often. I hadn’t considered the space limitation of 1080 recording, but it’s true that video will chew in to 16GB really quickly. Anyone who thinks they’ll have use for video recording should definitely get more storage. Wi-fi is not “ubiquitous” in the Boston area – most of the wi-fi is locked down tight. You need to go to a public library, or a friendly coffee shop, or maybe a restaurant like McDonald’s. I have a 16GB wifi -2 right now. 16 GB is nearly half filled with app. The creative apps are storage hogs. If you want to use the 3rd gen iPad for anything creative, or holding, viewing, and sharing video, 16GB puts me constantly at the pain threshold in having to delete some of the more interesting apps that get my right brain moving. I live in my left brain all the Tim, so this is important to me. I don’t tend to put music on the iPad, because I fill my 64GB 4s with music. I really think the 32GB model should be the base model for size, because with the Retina apps they will take up more space and things like sceen shots, 1080p video recordings, and camera pictures will be much larger. For that reason I recommend a 32GB model, though if all you plan to do is browse web and email then 16GB is more than fine. 32GB minimum will will be necessary for those using iPad 3rd Gen as a content creation device rather than consumption. Just my 2 cents, but I am sure all will be happy with whatever their choice! Completely agree with Carl. Nobody thinks about the retina apps and 1080p video recordings. Moreover, once you have purchased the device, you cannot easily upgrade it, let’s say from 16GB to 32GB or even 64GB. I am planning to use the device for at least the next two years, so I want to make sure whatever comes down the road I have enough storage to go with. I have ordered black 32GB model. I work in a hospital that doesn’t have Wi-Fi and since I don’t want to do anything personal on a computer system where every keystroke is recorded, for me the cell signal is a must-have. I recently moved 2000 miles and found the GPS on the iPad to be more useful than the GPS in the car. You can’t use the GPS/mapping feature without the 3G/4G signal. When I travel, I don’t take my laptop anymore and with some hotels charging $10 per night for Internet access, three nights would pay for my monthly data plan. I have a black 32GB 3G AT&T iPad2 and am anxiously awaiting my new iPad, black, 32GB, 4G Verizon. I’m switching to Verizon just for the hotspot feature. I have a 3GS iPhone with an unlimited data plan, and don’t want to give that up just to be able to tether my laptop. Think about it like this. 16gb is plenty. Thats what i had for my iPad 2, and what i have for my 4s. Movies especially will not be taking up any space on my iPad 3. For 1 you have netflix and things like pandora even for music. You have 5gb of iCloud storage that doesnt even go towards the space on your device. So for some music (most of my music is on my iPhone, and for apps), 16gb is plenty. Since the 4-year old commandeered the iPad 1 for his exclusive use, I’m making do with my 64Gb iPod Touch, waiting for the next iPad to come out. And I’m constantly having to do housekeeping on the thing, pruning my e-book collection … I’m flabbergasted that they didn’t go to 128 or 256 GB. Those new interactive e-textbooks you write with iBooks Author? 2-4 GB each (trust me, I’m writing one). And that was before you had to keep the new display with its voracious appetite for high-def pictures in mind. In fact, as new updates for your apps appear, you are going to see their sizes go up and up as they now include graphics suitable for the new display. These things don’t come for free. 16 GB will seem like a toy very, very quickly. “Wifi is everywhere”? Even in the USA, I guess you don’t get out of town much, do you? :-) Outside the USA, free wifi is practically unheard of and a 3G connection is not a luxury. And not everybody cares to carry a hotspot-capable phone. Buy the biggest, best equipped iPad your budget can possibly stretch to. Then resolve to keep it for at least the next three generations. Or follow the advice in this column, knowing that you will be upgrading again this time next year. My question is if I purchase the basic ipad3 wireless only, will I be able to buy/use a mobile hotspot device for those few times I travel in the summer and can’t find a ‘hotspot’? You can connect the wi-fi model to any wi-fi network, whether it’s a router or a hotspot, yes. Just get a wireless hotspot from “CLEAR”. You can use for the phone & iPad (wifi only) at a much faster speed comparing to any data plan you would have got from your mobile phone company. I will be in the USA in June and would like to purchase iPad, Wi-Fi + 4G LTE, 64GB, Black (AT&T). I see that amost of these are sold in the US with a network (AT&T, Verizon, etc). Does this mean the iPad is locked to USA networks and cant be used outside the USA on another network? Are the electrical plugs for the USA only or can be used in Europe? Does Apple provide an International guaranttee or just for the USA? Get the Verizon model if you want to have an unlocked 3G sim card slot, but neither of them will roam international 4G LTE. The electrical plug is different but you can use an adapter to plug it into a wall, an adapter costs about $5. it costs more money, otherwise no. I just purchased the 64 gb 3 w/ wifi and 4g. Once I loaded my apps, music and pics/vids, I was left with 18 gb. Best to get the 64 gb, unless you just want a fancy toy. The iPad has replaced my Windows based system for almost every app, the only program that does not have and equivalent app is Quicken. Any suggestions out there? Thanks. David, can ipad use MS office ? i want to buy one and i’m a university student. i wonder what it will benefit me ? it’s just i really want it so much. 16G black wifi only, is good ? or i just have to skip it and save my money. FYI the Cellular Data Plan (Verizon and AT&T) are being released as a family data shared option this summer, just like the minutes being ”shared minutes”. Which means you could buy 5 GB data plan as a shared family plan and have numerous devices of your family share the plan and have numerous devices in the same bucket including the iPad you own. I have one question. Will I get free WIFI forever if i take the 4G??? Please answer ASAP. I really need your help. Hello! With these uses in mind, the base model should be enough. All Ipad models have no USB connectors, but sure, you can transfer all your photos and files through iTunes. This is not a problem at all. Many thanks, all good advice. The 16GB suits me fine! I took your advice and went with a white 16 gb wifi only model. I have a 64 gb 3g Ipad 2 and still find it more than enough for me. All I have used up so far is 15 gb with dozens of kids apps, lots of music and thousands of books. I have now left the ipad2 to the kids and ordered a new Ipad with the retina display which I hope would help me read better. Listen to me! Go with the base model, black or white. I bought the new ipad 32gb wifi only yesterday as a birthday present for someone, but am now worried I have made the wrong choice and should have gone with the + 4G cellular model. The guy in the store who sold me it said I wouldn’t need the 4G cellular model because the person I’m buying it has a iphone 4s so can connect to the internet all the time using that. But I’m wondering whether it would just be more convenient to get the 4G and a pay as you go plan. I only have a few days to change it so could really do with the advice! Q : how can i buy game or app (not the free one) from itune?? Q : what is a gift card?? . .
I’m going to be purchasing my first iPad this winter, but I’m going to be using for a lot different purposes than most people. No games or movies – but extensively for graphic design (tablet drawing) and business/productivity with a decent collection of e-books. I’m not sure how apps like Adobe Ideas or Paper 53 store files, so would you suggest 16/32/64GB? Any ideas would help! Thanks! Actually, buy the 32 GB because 16 GB would become obsolete soon. Remember 8 GB iTouch?